Some of you might remember our beautiful finger jointed oak kitchen we created as part of Lozi's collection we launched back in May during Grand Designs Live and Clerkenwell Design Week. Designed for a very special client, who waited patiently for us to show it off to the world, has now been living with this gorgeous design in her stunning Brighton home. The centrepiece of a beautiful modern living space, this gorgeous kitchen has brought her home to life. The centre piece of this family home, this luxury high quality kitchen is the perfect mix of modern design and understated elegance. When designing this kitchen, Lozi started experimenting with combining plywood and solid oak which has become one of our favourite material combination. The wholesomeness of solid oak, with the warmth of the wood and natural patterns, contrasts perfectly with the modern high tech feeling that plywood gives off. 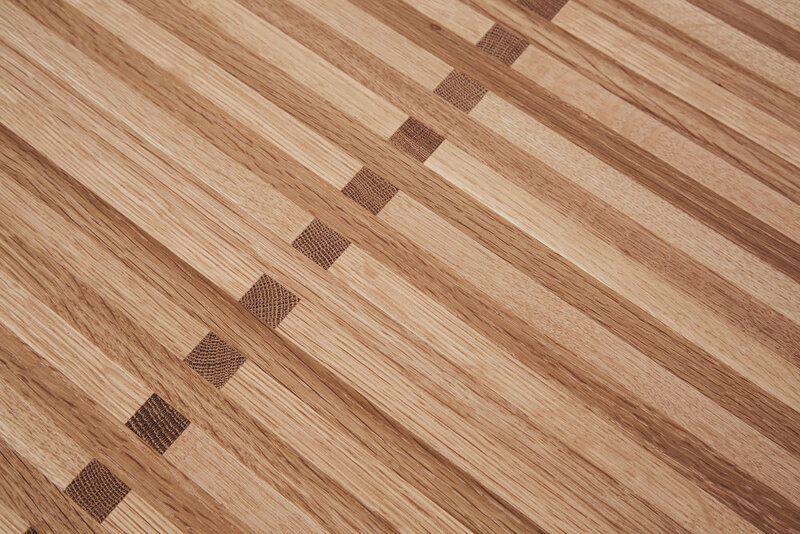 By using traditional finger joining techniques on the oak surfaces, the Makers at Lozi brought both materials together to create a modern and highly desirable piece. 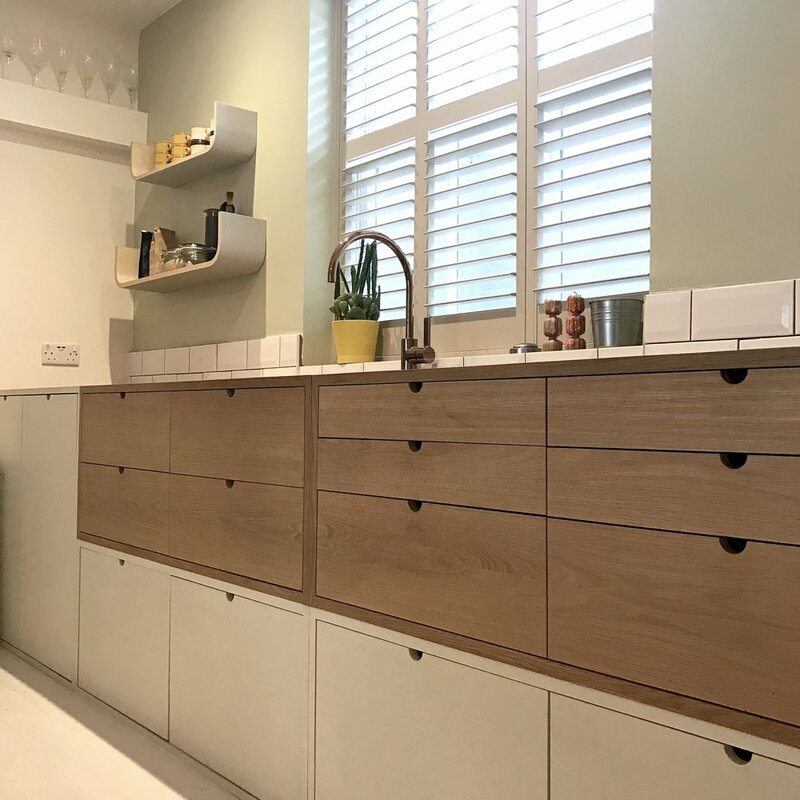 We absolutely love the delicate contrast wall, painted in a light pistachio colour behind the kitchen counter, adding an extra colour dimension without enclosing the space. This colour is also picked up with the kitchen chairs, living room cushions and scattering of plants across the room. 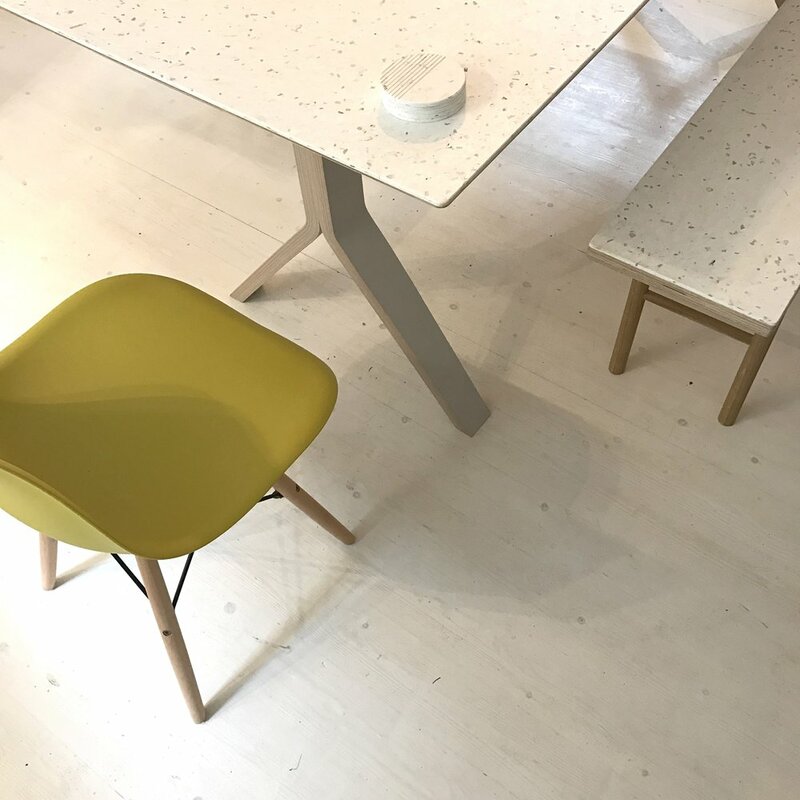 Lozi's distinctive U shelves have been painted in a light grey, complimenting the legs of our bespoke Sea Table, bringing the colour scheme together without making the space looks matchy-matchy and contrived. Finger jointing is a traditional woodworking technique, used to create strong and eye catching joints in cabinetry, maintaining strength without the need for screws or nails. By cutting each piece of wood individually, the makers at Lozi created this distinctive pattern and checkerboard effect, and echoed plywood's signature stripe design. The drawers are made from birch plywood and finished with an oak veneer. Want one of your own? Have a browse of the Lozi products featured in this home right here, or get in touch via the form below!